Feb. 15: Countdown host Keith Olbermann has signed on for a “second term” at MSNBC. Olbermann discusses the success of his show and its future with MSNBC’s Alison Stewart. 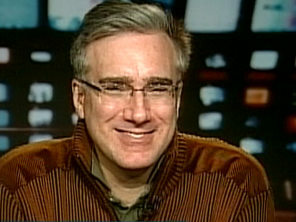 Feb. 15: Keith Olbermann is sticking around MSNBC for four more years. In unrelated news, the latest Britney Spears gossip. Countdown’s Keith Olbermann explains that the show is creating a new version of the segment. MSNBC.com is a joint venture of Microsoft and NBC Universal. MSNBC cable is a wholly owned unit of NBC Universal. NEW YORK - MSNBC’s flagship franchise is safely locked in place for four more years after “Countdown” host Keith Olbermann and NBC News agreed to an extension of his contract through 2011. In addition to his nightly newscast -- which counts down the day’s top political and entertainment stories with Olbermman’s signature wit -- the MSNBC host will contribute occasional “essays” to the "Nightly News with Brian Williams" and host two "Countdown" specials a year on NBC. The "essays" will be different from the Olbermann's "special comments," which have resonated with "Countdown" fans and helped boost the show's ratings, up 85 percent over the last year. "Countdown" finished the month of January with an average of 715,000 viewers, with 283,000 in the adult demographic (25-54). In an interview on MSNBC with Alison Stewart, Olbermann attributed the success of his show to being in "the right place at the right time." "There was just a sense, last year I think, that stuff needed to be said in this country and the first 95 people who probably should have done it didn’t," Olbermann said. "I just looked around and went, ‘I guess I'm the one who has to jump into the water and try to help the guy out.’ And the response to this was just phenomenal." Rather than the politically-oriented "special comment," both Capus and Olbermann pointed to Olbermann's coverage of the death of Pope John Paul II as an example of a potential "Nightly" essay. "It could be that important, that topical or as obscure as tripping over the fact that Abraham Lincoln never said 'you can fool some of the people all the time,'" Olbermann said. "Just something that is interesting to me and may not be known to the audience." During a press conference, Capus dismissed a suggestion that Olbermann's affiliation with the network might bolster accusations by conservatives, including Bill O'Reilly who has been feuding with Olbermann for years, that NBC's news coverage is liberal-leaning. "I believe that the viewers are sophisticated enough to know what messages are being offered to them and the viewers have spoken on this by the ratings performance at MSNBC," Capus said. The opportunity to contribute to Nightly News and NBC was a major reason Olbermann decided to stay with the network, according to the host who has a history of jumping from station to station. "Well I mean if you look at my career track record, I suppose I and all of my employers for the last 27 years, 28 years that I’ve been in this business probably have awakened every day wondering whether or not I was going to be staying where I was," Olbermann quipped during the press conference. "I suppose that at some moments I thought it was possible that I might not continue, but honestly, I never had that sense that I was going anywhere else." Olbermann’s resume includes stints at CNN, ESPN, and Fox Sports Net. He worked for MSNBC from 1997 to 1998, returning in early 2003 and launching "Countdown" on March 31 of that year. “Four years ago last week, I went back to Secaucus to do three fill-in shows," Olbermann said. "Not three programs, not three series, but three individual hours of television and the next thing I know I’m in here for eight years. So you can never make plans. You never know how it’s going to turn out, but it’s turned out extraordinarily well."